"The real world is cold! The real world doesn't care about spirit! You want to be a hero? Then play the part and die like every other Hero in history! As for me, I'll do what I do best: lie, steal, cheat and survive!" While born to a family of simple means in Yarrose within Ornweinne. Jarvis never found himself happy even as a youth pleased with such what he'd say was a meager living style. Desiring early on in life a enticement towards excitement and the luxuries of the world that escaped his means. Taking to his own path early on when hes parents passed on from mysterious means while he was still a youth. Rather then take up a trade he took to more underhanded forms of making a living. Learning to be a moderate pick pocket in childhood. But over the years as the boy grew. Working with several other more skilled criminal groups or gangs briefly each time. He discovered new tricks of the trade as well as an affinity to certain types of magic he may have had no idea prior he held such a natural instinct towards. Being taught through several sets of means over the years like the tools a rogue and a smuggler would need to escape the law but also defend himself in a time of need. The boy becoming a rather fine looking man as well. Able to blend in in most surroundings and gather contacts over several lands over. Learning how to mask imports and smuggle in several types of goods depending whatever was in demand. Taking on several types of work as well to always keep within luxury or a lively hood he enjoyed. To see him would be to never expect he lived as such. Often appearing as if he was a noble or someone of importance from the way he'd dress in casual as well as speak with a edged silver tongue as if it itself could kill. His actual work and connections usually kept very quiet often. Jarvis usually careful about such things to ensure he keeps himself out of any of the local jailhouses. He moves around often on jobs or business of several kinds. Using more often then not the power of illusions, coin, or speech. Rather then his blade or pistol to get where he needs to go. Learning along time ago mutually beneficial crime could even entice some guards and people in official positions if you were smart about it. Raising the chances of a lucrative easy career of scheming and careful movement if you were willing to share a slice of the pie here and there and had contacts that could remain discreet. Always working in way or another helping to move goods and avoid the taxes of each land when doing so. As well as moving goods and items that weren't always on the up and up some might say. But do to his connections built from both dirty trading, and illegal imports and smuggling as well as quite a few illegal dealings. He always usually has a quick escape from any city planned. Often always quick to escape and vanish just as mysteriously as he appeared. But each time one see's him its always unmistakable when you meet him. Leaving a 'Je ne sais quoi' sensation and impression often in all he meets. To find him however its said if you learn his name. An go asking for him around certain brothels and ins in certain towns. He'll find you before you actually find him. A simple and over the years trained set of moves for a keen blade hand. Quick precise and ready at a moments notice. A warrior or rogue can be quick and precise when trying to carve into ones enemies. usually making them a danger in most any battle. Its said one with enough skill can even slice away small targets with extremely well placed precision. Its said those as well skilled with a fire arm can pull of such tricks with a clever shot as well. Sometimes instead of a blade a quick hand and a bit of black power firearm weaponry are more the ticket. Allowing a quick hand at the ready to be ready to fire down a unsuspecting foe. Some may call it dirty but the victor may reap the spoils. Spiked balls and caltrops as well. Tricks of the trade dropped in a room or area around your enemy in battle. Usually good to keep someone away from you or from chasing you pending the situation. Always a decent little trap that can leave a dangerous injury two should you step on them. Whats the world without a love and appreciation! With a snap of the fingers or sweet whisper. Jarvis has learned a old art of magical seduction and charming. Allowing him to dissuade people from desiring to attack him. But instead for a short time to idolize him if not momentary be caught up with emotions for him. Making him briefly the pinnacle of their desires. However if someone far more powerful then him its had little effect in aiding his escapes if the person is able too... forcibly keep him near from their new found infatuation. With similar fashioned magic as when seducing someone. One can also plant hate like one can't plant love. With careful skill learning to inject magic into word or touch to impose anger or hatred as well into a target. Creates copies of images or one self if one desires. Allowing alluring fantasies to take over a target senses for a time. Allowing them to see, smell, and hear the images as if they were really there. Good for tricking a weak mind or sometimes in battle a strong one. Its said physical changes can even occur making the illusions in fact real for a time. But such focus as that is more hard to pull off. Always being the quick talker and silver edged tongue of a liar. Jarvis has found himself able to sweet talk most people in letting him go or siding with him even at times when all else seemed to be hopeless. Knowing usually just what to say and exactly when. Even if no one else did. Quite a few times getting what he wanted without ever having to even consider drawing his weapons. A life of learning how to get ahead and how to spot a opportunity. Jarvis has learned to metaphorical smell out the gold. Making a living anyway and however he needs to survive and also live happily and joyfully as he likes. Getting the money or learning to procure what he wants by other means. Always getting what he wants in the end thanks to his experience and somewhat rough past. Rather through distraction or quick movement. Jarvis has learned in a battle when things get serious he'll do sometimes whatever it takes to win. Aiming to keep his enemy if he can on their toes and always at a distance. Looking for any opening and any chance to subdue them and claim victory or escape for himself. It was hidden among deeper inland parts of the port town near Yarrose. Some of the more questionable areas near market that kept out of the eye and reach of the old men and women that liked to think they ran things in this county. Several allies deep in what could be seen as a maze of some sorts of closed in thin allies. A small inn of questionable desires meant to only be easily found by those that were specifically looking for it. A small sign hanging above the twin wooden doors outside with a dangling sign that squealed on rusty hinges it hung from above the door. The shape of a cat's paw that read the 'Kitty's Desires' upon the sign. Several little images under the words as well cut in of several types of animal faces. Cartoon like but giving a winky face as if to entice jestingly to the few passing by that came down this dark alley way of desire. The buildings looking rather odd as well in the dark alley but this one holding a rather clean and well done white painted walls with roses and several flowers weaved outside along the architecture of the building. Creating a scene of a beauty among the grim grime given the more dingy buildings built around it in the tunnels that weaved together for this spider web of alley ways. Inside this place of ill repute however was perhaps a more sense of actual business going on then its normally more under the table payments and services. You see a place of special desires that claims to cater the desires and needs of most. Often needs more then just some pretty faces and physical sensual vices. Several types of narcotics, rare liquor, and even some forms of magical potions and drug like magical dusts were in high demand. Procuring such things often took time as well as risk of injury, fines, or jail time. Things most did not like to risk as to why middle men and businessmen of a certain note were usually called on to aid with such things. The owner of said establishment sitting across from the dealer of goods. A smile on his face a violet haired (clearly dyed) Oni. The oni not a bad looking but clearly not to be messed with type of individually. But friendly enough as known to only be rude to the more non paying forms of customers. Across from him was a rather well dressed individual as well. 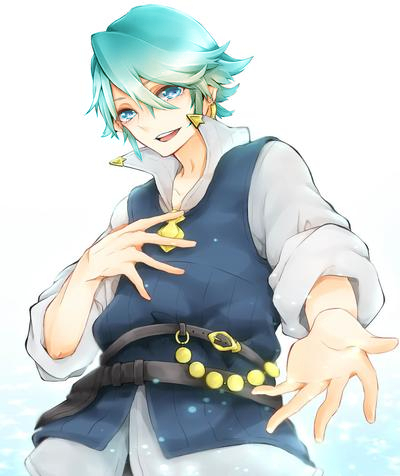 A human with aqua styled hair and cold eyes of aqua ice. A smile as well that appeared as keen as the devils but had a way of looking like it said on its own we could work this out type of impression. A half eaten meal sat before him and a cup of rather pricey wine already half gone. The negotiation had gone rather splendidly so far but it seemed the dealer was more then willing to press to be treated fairly well and was more then willing to be buttered up or bribed some might say a little to give better pricing at the end of it all. The meal and drink nice offers that the man would hardly refuse. Although the food and drink had passed by with soft conversation leading more into the deal. The oni owner implying and easing into the several forms of potions and rare intoxicants he needed for his more discreet usual customers. Jarvis knowing better then to pry into who actually were these customers when he already had a possible fat payment already coming his way when he settled the deal. He listened as he with a large glass object burning some special dried plants in the center of the table. He'd... been here before. So the Oni knew exactly what all to offer to make sure Jarvis was ever willing to keep listening and possibly give a kind deal if treated to some special delicacies not easily procured elsewhere. The hose attached to the glass object burning the dried plants's mouth piece was placed between Jarvis's lips. Drawing in a heavy breath of a thick smoke that rolled throughout his lungs and casually passed his lips out shortly after in slow relaxing breaths. At either side of him a fox girl Kitsune some might call them. One of the rarer girls the owner had procured in his services. Pink fur and eyes that looked as if she was the hunter eyeing her prey. Several tails constantly weaving behind her in a mess of fluff and enticing cuteness. On his other side a dragon boy with blue scales along his rather feminine body even in his more humanly form. Eyes of dark blue as well as his hair the same in tint. Both of them staring at Jarvis with desiring eyes and lathering at his neck and lightly on his chest where they'd opened his shirt teasing with kisses, licks, and mild bites. A little lower given they were sitting on pillows at a more oriental style of table. Their hands shifted one of each of them together passed his unbuckled belt for awhile know slipped within his pants helping to... ease the dealers mind into a more relaxed state as the discussions went on. Jarvis seeming to be... more then willing to allow the owner to use his little tricks against him. "That being said... A crate of gods nectar brandy... An perhaps several vile's of everything else on the list of what I said would be superb. It may seem like allot but I'm always in need of a constant supply. So the better price you cut me could easily mean more constant business yes? I mean if setup, Such a thing would be looked on very kindly in turn. Even kinder then my friendly hospitality now." The Oni would say smirking licking his lips and giving a slight wink to his employees. Jarvis drawing in a heavy breath of smoke himself and placing down the cord linked to the ornamental hookah. His cheeks lightly red at this point and a smile that looked softly intoxicated and pleased. His breaths lightly slow as from even above the table one could see the soft motions of both the lovely Kitsune's soft arms moving towards the action under the table as she smirked nipping Jarvis's chin and the blue scaled dragon boy doing the same. Just as soft if not more feminine then her in his features and actions. "A crate... That's awfully pricey. You're also asking for quite some top grade brews here. Stuff that would even leave..." Stopping for a moment clearing his throat as the Kitsune with the pink hair rather suddenly lowered herself vanishing beyond the border of the table top. A more squishy like sound being heard after a jangle of buckles that had Jarvis lightly freezing up and clearing his throat as she moved to loosen him up a bit more. The dragon boy just keeping with now both arms around Jarvis and kissing at his cheek and ear whispering and nipping lightly with teases of words and tongue. "Ahem...Well. I mean I guess it co-o-oould be arranged. It'd Just cost yOou... Twenty percent the usual rates of the others companies. My stock would be better anyway." He'd say his face utterly crimson now. Looking rather colorful with the bobbing pink haired fox ears appearing up and down just above his lap at the tables edge. And the blue haired dragon with blue scales kissing like a seductress at his side. The smokes effects as well worming through his body enhancing his sensation to pleasurable touch both physically and mentally in sensation..
"ten percent...." The Oni would speak out fast. His smirk still held strong as if the dealing had finally come to its climax of the most serious moment or was about to at least. Jarvis breathing heavy when his brow would lightly twitch and he'd shoot back with. "eighteen percent... That's still better then anywhere else." The Oni remaining calm but clearly from a glimmer in his eyes of perhaps silent annoyance. One could tell that was not the price he'd hoped for. "fifteen percent, I need to have money to keep this place running well. I have mouths to feed and not just with what they are currently eating now." He'd say with a near chuckle. Jarvis shivering briefly as he felt a light bite of animal teeth scratch playfully at his most favorite appendage in the playful job she was doing. "Easy there foxy... Hmm. Fifteen percent and free room, board, and services whenever I desire! One man can only take so much after all. With all the fine goods you're procuring too you'd easily be able to afford that after all." The Oni seeming to think on it for several moments. Running a hand through his purple locks of hair and letting out a long drawn out breath in contemplation. He'd nod and go to put his rather large hand over the table presumably to shake hands but stop. When Jarvis was about to do the same but seemingly in a shiver of excitement pushed his hand down the moment after on reaction upon the back of the pink haired fox's head. Fingers weaving with the fur at her animal like ears. A gurgle sound echoing into the air and muffled words. Followed by a sound of gargling and eventual gulping. The pink haired fox raising moments later after cleaning her mess and gulping a extra time after her face had raised with perked ears giggling lightly. A light shine at her cheek and lips. "Well while I would have settled on shaking on it. That will do just fine as well I suppose. hahaha! I must say at least dealing with you my old friend. Its not daggers and threats that are used involving the game of negotiation." The Oni would say rising from the ground and pillow he sat on himself. "I assume usual place for the pick up yes. I'll have all the coin ready in a couple days. Until then feel free to remain here. I'm sure you'll find your stay most satisfactory. We closed early for the day so our business would not go undisturbed so. Please... enjoy yourself in the privacy of the Kitty's Desires." He'd say soon rising as if about to take his leave. Jarvis rolling his eyes but they both knew he was going to refuse. "Hey... Have I ever let you down? There's a reason you come to me for more then just my kind angel like demeanor! I'm just the best at what I do!" He'd say chuckling lightly as the Kitsune roughly shoved him on his back with a ferocity not present previously as a more dominate nature took hold. Sitting on his stomach and placing hands on his wrists to pin Jarvis down. The boy snarling up at her in a rather playful intent. The Oni walking towards the bar to pour himself some enchanted brandy to help relieve stress and joint painss. As he did this the dragon boy wrapped his arms around the kitsune from behind. A little further back as she say on Jarvis's stomach pinning him. The boy taking position elsewhere and situating a special essence fiber on the rather heated Jarvis as moments later after this a moan shot out from a strong sensual reaction from the dragon boys lip from where he situated himself atop on. The Oni only adding in as he took his leave for the time. "An angel?... My friend the mere thought of you being a angel has all of hell laughing on their backs... Enjoy your stay.~" He'd say taking his leave. While Jarvis stayed in the company of the sweet Kitsune's that kept him restrained while Jarvis learned what it was like to ride a dragon in more sense of the world then normally implied as the blue scaled boy's head bobbed up and down behind the luscious pink fox before him. Everything looks good to me, accepted!